June | 2015 | Planet Pedro! Posted on 06/13/2015 by planetpedro CommentsNo Comments on How To Talk About Immigration. How To Talk About Immigration. In 1966, Roy Jenkins made these comments on immigration to a London meeting of the National Committee for Commonwealth Immigrants . These were the days of Alf Garnett, of “No dogs, no blacks, no Irish.” Of colonies and assumptions of racial superiority. Current Labour leadership candidates please read and learn. Integration [can be defined] not as a flattening process of assimilation but as equal opportunity, accompanied by cultural diversity, in an atmosphere of mutual tolerance. Posted on 06/12/2015 by planetpedro CommentsNo Comments on Oi! Would-Be Labour Leaders – Do You Want A Strategy? Oi! Would-Be Labour Leaders – Do You Want A Strategy? I have received an email from Yvette Cooper’s campaign. It was very smart and used the Nationbuilder software, which was impressive. So far, so good. As was the statement “I want to be the Leader of the Labour Party and the next Prime Minister – not to be something but to do something.” Again, it is fine – but only really what you would expect – or is it? Having already made my point about the way in which Labour leaders should campaign (in poetry, and leave the dull prose to governing I Will Vote For Whoever Can Bring Poetry To Social Democracy (Metaphorically Speaking). http://wp.me/p3f2py-eh), Yvette’s statement appears to me to miss the mark of what she (or any other Labour leader) should be telling us: what they think the task is, and how the intend to approach it. Non-one needs to be told that Labour has gone backwards, in some places – above all here in Scotland – to pre-1920s levels. And it gets still worse: last time we polled so low, we were on the rise as a newly formed and wholly untested party. Now we are falling on the basis of our record in government and – worse yet – we have been severely punished in opposition. Our next leader needs to understand that Labour has no future unless we acknowledge that we will not be a party of government again in the foreseeable future without drastic and profound changes. In fact, the most significant personality of the 2015 election may not have even been present: perhaps it was Gillian Duffy who ruined Gordon Brown’s day and campaign in 2010. The ghost of ordinary voters like Mrs Duffy popping up and asking legitimate but awkward questions was part of the fear factor which infected Labour 2015 like a dormant bacillus. It was kept under control until the Question Time audience took Ed apart on the issue of overspending. By then, it was far too late to explain Labour’s public expenditure record, and above all, there was no background or framework of our values against which to justify it. Then the election was all over, with the EdStone (another Hall of Mirrors product) serving as a mockery of our fate. What I really want to see and hear is a strategy for the future of Labour, like a failed company or brand or corner shop might have. This is all pretty basic business management stuff: you need some VSOP: a Vision, a Strategy to achieve it and the Operation Programmes to support that strategy and make the vision real. And timescale and milestones. How about this for a try? Vision: this is in place: “The Labour Party is a democratic socialist party. It believes that by the strength of our common endeavour we achieve more then we achieve alone.” This is excellent: ordinary people can identify it in their own experience of family, community, workplace, even their football team. If they do not know that we stand for this, it is our failure, not that of the voters. Strategy: how we pursue that vision can be focussed on key programmes based on supporting core values. I propose three of them: Liberty, Equality and Solidarity, to be realised by using the legislative and institutional tools available. Bevan referred to the Labour Party using democracy on behalf of the people to attack privilege. That is a good start, along with parliament creating new liberties, and new laws to protect and enhance equality, and redistribution mechanisms to make Britain fairer. It is doubtful if one in a million people could define Labour’s political aims in any such terms. That is our failure, not that of the voters. Operational Programmes: these are how each of these strategic goals can be served by the different means at our disposal. And I do not think at the stage, our new leader needs to set them out: instead, they should make a virtue of asking others how to populate the operational programmes for a future Labour government. Let us ask trade unions how their members and all workers can best be served. Let us ask parents and teachers how schools can be made to work better. Let us ask patients and health professionals what the priorities for the NHS are. Let us ask police and magistrates and prison officers the best way to keep our communities safe. Let us ask businesses what they need to succeed. Let us ask how they can work together with Labour to make Britain better. If they do not look to us to do so, that is our failure, not that of the voters. What I want our next leader to do, in fact, is to turn the whole Miliband project on its head. I want not to start out with a string of things that we think would be good in government (worthy as they might have been) but to start by impressing on the public what we are and what we are here for. Time and time again during Labour’s catastrophic decline in Scotland we have been told we must be more like the SNP (albeit usually by our enemies). I think, in one respect, we should take that advice. The lesson which we should learn is that we need to win hearts and minds – and crucially in that order. If we look at how they have succeeded it has precisely in that way. As part of the Yes campaign, they expected to lose but wished to make headway, and above all saw the opportunity to win hearts with an emotional (in many senses irrational) appeal to the electorate. This is now being followed up with attempts to add minds, explicitly through a more rational economic policy as set out in the General Election campaign. Labour should do the same, and to win hearts by concentrating on our vision, and the key components of our strategy. The first milestone in the progress Labour’s strategy for recovery must be to get home that message of our purpose. A suggested timescale might be two years (the Fixed Term Parliament Act helps here.) Phase 2 should hammer home the core values (a further two years); and Operational Programmes is the manifesto development process for the 2020 General Election. And if – as seems likely – we do not turn over the Tories then, we have our identity and values secured in the public mind and a tool kit for 2025 manifesto. If there is any advantage of the depth and breadth of our defeat, it is that we have nothing to lose. We do not need to fear the loss of a few hundred votes here and there, if we need millions to govern again. We must use that space to become a new party, based on our enduring qualities. We achieve more together than we do alone. Liberty. Equality. Solidarity. If we can win the hearts of voters with these noble and historic ideals, their minds will follow when we ask them to work with us to make them real. And if we cannot, the game really is up for Labour. And it will be our failure, not that of the voters. 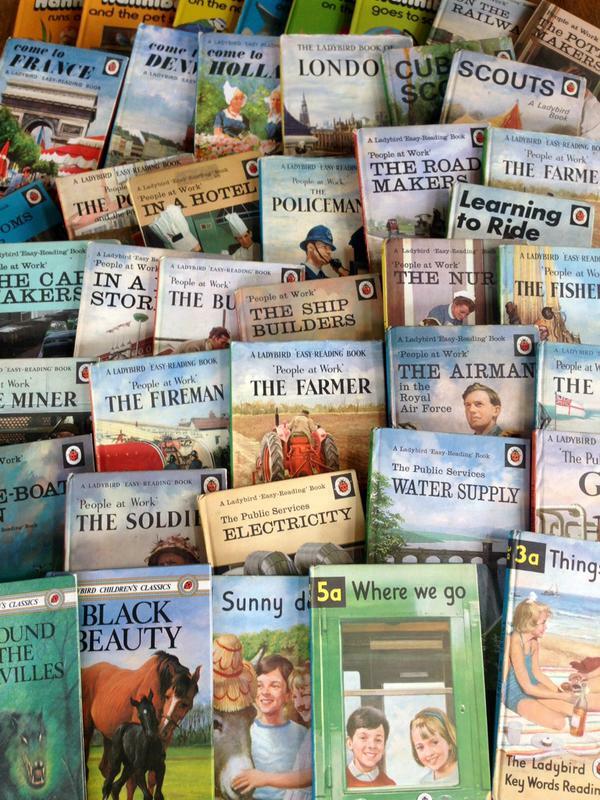 Posted on 06/09/2015 by planetpedro Comments1 Comment on A Wee Thought About Ladybird Books. A Wee Thought About Ladybird Books. The thing that struck was not just the nostalgia of the Ladybird Books, which were a fixture in every 1960s primary school classroom of my childhood, but the subjects. These include the series on “People at Work” (The Roadmakers, The Fireman, The Farmer, The Ship Builders) and “Public Services” (Electricity, Water Supply). Obviously things change, and one of the interesting features that Helen Day sometimes shows is how Ladybird books did so too, for example, the elimination of smoking and the desirability of safety measures such seatbelts and lifejackets where appropriate. However, the respect afforded to working people and their occupations, and the need to teach children about the value of utilities and public goods now seems like a feature of a lost age; especially so as Ladybird Books were so ubiquitous in the primary schools of period..
Posted on 06/05/2015 by planetpedro Comments1 Comment on I Will Vote For Whoever Can Bring Poetry To Social Democracy (Metaphorically Speaking). I Will Vote For Whoever Can Bring Poetry To Social Democracy (Metaphorically Speaking). …which is admittedly a tall order for the Labour leadership candidates in both the UK and Scottish parties. But it is what we need: as New York Governor Mario Cuomo said back in 1985: “we campaign in poetry but we govern in prose.” And the former is what Labour has been failing to do big time. [David] Axelrod was appalled by the low quality of the ideas being discussed, which he derisively characterised as “Vote Labour and win a microwave”. In Scotland, it now seems an eternity that we have now suffered from the lack of imagination and articulacy necessary to be competitive in, let alone to dominate the political agenda. Since “there shall be a Scottish Parliament …I like that…,” can anyone remember a memorable Labour Leader quote? From Henry McLeish (other than “a muddle not a fiddle”?) From Jack McConnell? And even if these can be excused by Mayor Cuomo’s distinction between campaigning and governing, what about Wendy Alexander, Iain Gray, Johann Lamont and now Jim Murphy? Between them they can muster “bring it on”, “something for nothing” (albeit usually misquoted), and “I am not a unionist” by way of memorable phrase-making. From these examples, we can see that by poetry, Cuomo did not mean formal verse, of course, although a conference speech in Alexandrines or heroic couplets might usefully supersede the over-rated (and occasionally disastrous) fashion for not using notes. Instead, he means two things. The first, in these examples is the use and indeed manipulation of words, their sounds, their order, their rhythms, to capture and retain the imagination of the listener and the public. The second is to prove to those same listeners that you can transcend the everyday: that you are the same as them in having hopes, dreams, aspirations for themselves, their children and their grandchildren. The poetry of politics is the use of words to show people a vision – and connecting them to it. In contrast – and this is the frustrating part – Labour politicians have chosen to campaign and to oppose in the dullest of prose. In the Scottish Parliament, following the defeat of 2007, we sat back and waited for the SNP to implode and to turn on each other as Fundis and Realos. Quite sensibly, they refused to do so, and we lost the opportunity to set out our vision of a better Scotland in a better UK and a better world. Instead, in 2011, the SNP used a simple, persuasive form of words, shorter than a haiku “Be part of better. Vote SNP,” captured the collapsed Liberal Democrat vote and achieved its majority and mandate to hold the independence referendum. In the meantime, Labour had been a passive and mute opposition, behaving (in prose) like a government in waiting while all the time losing support. Likewise, at Westminster, two things emerged. First was that after 2010, Ed Miliband had avoided the Labour Party splitting as it usually does after electoral defeat – and that he had done so not by galvanising us, but by putting the party into a medically induced coma. Secondly, and incredibly, it was following the example of the Scottish party, attempting to win an election by not losing it – through keeping a core vote and looking to nudge it up to 35%. In both cases, the result has been catastrophic. By not moving on, Labour has volunteered itself for all of the opprobrium which comes with failures in government while not offering the vision of a better life for the electorate. To go back to Mario Cuomo, we have been campaigning in prose. In Scotland, this has been especially suicidal as the independence referendum gave our opponents the absolutely perfect opportunity to capitalise on the advantages of vocabulary and semantic which “Yes” afforded them: positivity, freedom, self-determination, better future, progress, better life for our children and grandchildren, etc, etc. All of this was worthless without a credible currency or economic plan to back it up, but it was effective rhetoric which captured many imaginations, and a result, Better Together and Labour were always in the shade and playing catch-up (to mix metaphors). At the end of the campaign, Labour was so beaten that it could not even be proud of its referendum victory, which had saved the people of Scotland from potential economic ruin. And so by the autumn of 2014, we had the SNP in full command of the public debate in Scotland, where they stayed and improved their standing right through to polling day in May. It is too late now to look at what might have been: if Labour nationally had been able to articulate a more positive alternative, if Scottish Labour had established a vision of mutual support and sharing, of the potential of common ownership of national assets, of revenues from the southeast of England redistributed for the benefit of Scots. Of ties of brother- and sisterhood. And we can see that when such ideas came to the fore, it was too late. Gordon Brown was wheeled out – and spoke brilliantly. David Torrance described Jim Murphy’s oration at the Tollcross rally as “the speech of his life”. Ed Miliband weighed in at the same event. But no-one was listening to the message. The reason for that is again that we had failed over the longer term of years and decades to use language which reflects our values, and which transcends our inevitable failures and re-affirms the aspiration which we share with voters. The only good thing to come out of this debacle is that we can start afresh. Kezia Dugdale is correct when she says that after such a comprehensive defeat, all that remains of Labour is our values: we are a party of fairness and equality, and “everything else is baggage.” Ken Mackintosh says something similar, as do most of the candidates for the UK leadership. This is welcome, and indeed must be the foundation of Labour’s rebirth, along with solidarity – “we achieve more together than we achieve alone”. These give real backbone to our mission, and indeed more than match the “ Scotland-first and hell mend the rest” of the SNP and the spiteful greed of the Tories. But these will mean nothing until they are fleshed out with measures to create the progress needed to build a fair society. And none of this will count unless all aspects are articulated with craft, with heart and with imagination. In other words with poetry. I am waiting to see who can provide it: whoever does manage to get values, actions and poetry together will get my vote as leader. Posted on 06/01/2015 by planetpedro Comments1 Comment on Mining Poem – Elegy. From the inkline valleys to drill miles beneath the Firth of Forth. The exhausted creak of lonely pit props a mile down and a century away.